Hi, it’s me Alan—yes, I know I am becoming a blogoholic. On Friday 8 March 2019 I attended the Queen’s Nursing Institute event, ‘Better Health for all Women especially those suffering homelessness’. It was held at Birmingham City University South Campus: it was a very good venue and we were well fed and watered, and all the speakers were women who introduced themselves with ‘nice to see you all’ on this International Women’s Day. Us poor menfolk were outnumbered by 20/1. The four key themes of the meeting were: Improve quality of local health; and housing systems; improve access to healthcare; and, increasing knowledge and awareness. This was followed by six key recommendations: Accommodation, Collaborate, Together, Initiative and Intelligence, Ownership, and no Gaps in care. The main point out of these six to my mind was to foster collaborative working for homeless prevention and reduction and to ensure all health services understand their responsibilities regarding care and treatment of those that are homeless. I was impressed by the first speaker Maeve McClenaghan, a journalist from The Bureau of Investigative Journalism. She talked about how no real records were kept that identified those people who had died homeless, and how that all started to change after a man died on the doorstep of the Houses of Parliament. She said that every week this past winter two people died sleeping rough and since October 2017 a total of 796 had died homeless; 22% were women. The main causes of death were drug/alcohol, violence, suicide, and around 1/3rd had treatable conditions. The next speaker who impressed me was Dr Francesca Albanese, Head of Research and Evaluation from Crisis. It was nice to meet up with her again as we had met previously at Revolving Doors; she was part of the Advisory Group then. She talked about her work within Crisis and that they work directly with thousands of homeless people every year across Twelve Skylight centres in England, Scotland and Wales. They use research to find out how best to improve the services, but to also find wider solutions to homelessness. Together with homeless people and Crisis supporters, they campaign for the changes needed to end homelessness for good. The impact of homelessness is well documented and has wide-ranging impacts on individuals including relationship breakdown, loss of employment, alcohol and substance misuse, mental and physical health issues, and criminal activity. If not addressed promptly the challenge of ending homelessness gets harder as the support needs increase. A very interesting presentation by Rachel Brennan, the Homeless Service Manager, Urban Village Medical Practice got my attention too as I had heard all about how we could learn from other countries on how they are dealing with homelessness. Rachel suggested how we could learn lessons by taking a leaf out of their book, mainly Scandinavia and the USA. These included street medicine provision (healthcare directly to those living on the street); low threshold clinics with flexible and accessible appointments that reduce the demands on patients; medical respite clinically supported intermediate care for homeless people; mobile health clinics (use of vehicles to extend care to those on the streets)—these are just a few but there are many others. The meeting didn’t pass without further mention of the Gutter Frame Challenge, you will be pleased to know. During an any questions session nearing the end of the day one of the questions from the gallery was why they don’t bring along service users who have been or still are homeless to these events, so they could tell their story. The women next to me nodded in approval so I told her I was one of them to which she replied you should have been up the front then telling your story—I naturally agreed with her. It was another worthwhile and enjoyable day and I have the presentations all 173 pages if anyone would be interested in having them emailed to you, I will gladly oblige. Alan Kilmister is a Peer Researcher and Expert by Experience with HSCWRU’s Homeless Hospital Discharge Project. The project, which is led by Senior Research Fellow at HSCWRU, Dr Michelle Cornes, is due to report shortly. 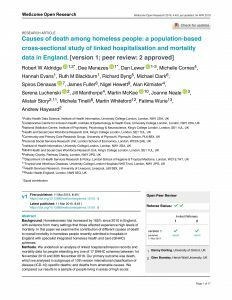 The project researchers last month published an open access article in Wellcome Open Research—‘Causes of death among homeless people: a population-based cross-sectional study of linked hospitalisation and mortality data in England’. This entry was posted in Homelessness and tagged Alan Kilmister by Stephen Martineau. Bookmark the permalink.